We use both scientific and natural ingredients – including advanced peptides, vitamins and many fruit extracts that work to restore all skin types to their full potential. Our products use optimized concentrations of these active ingredients with no unnecessary fillers and are formulated to address multiple signs of aging. We develop our products with the highest level of transparency in mind. No secrets, just science! 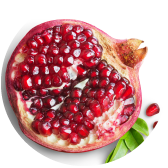 Pomegranate seed oil is a rich, effective moisturizer that boosts collagen, reverses skin damage, enhances elasticity, and reduces the appearance of scars without leaving your face feeling greasy. Suitable for all skin types, it has amazing regenerative and anti-inflammatory properties thanks (particularly) to the punicic acid found in the oil. Combined with the other listed ingredients, pomegranate seed oil helps to enhance skin’s radiance and slow the signs of aging. 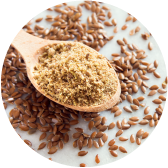 Flaxseed oil contains the highest level of omega-3 fatty acids among vegetable oils, making it just as great for skin as it is for your diet. Applied topically, flaxseed oil helps to plump the skin and repair skin cells to improve firmness and texture. The fatty acids also lock in moisture and and balance out your skin’s own oils for ultimate hydration and nourishment. Jojoba is an excellent moisturizer that is often referred to as an oil, but it’s actually a light wax derived from the desert-dwelling jojoba plant. As a wax, it locks in moisture and absorbs quickly into the skin for ultimate hydration all day (or night) long similar to the naturally occuring sebum that lubricates our skin and hair. 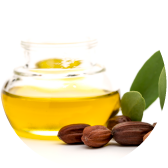 Jojoba seed oil is rich in vitamins and minerals including Vitamin E, Vitamin B, and zinc giving it amazing anti-aging properties. 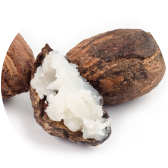 Babassu Seed Oil is extracted from babassu palm seeds which are native to the Amazon rainforest and tropical areas of Brazil. It appears very similar to coconut oil, but babassu seed oil is much more lightweight and absorbs quickly, meaning your skin is left feeling hydrated without that slick, oily feeling. It’s packed with vitamin E, and lauric and myristic fatty acids and virtually non-comedogenic (does not clog pores) making it perfect for daily use. 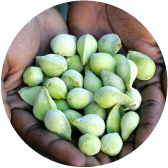 A fruit native to Australia, the Kakadu Plum has long been used by Indigenous populations for everything from food to a healing remedy. It contains high concentrations of Vitamin C, more than 50x that of an orange, helping to even skin tone and fade dark spots as well as promote anti-inflammation. The Kakadu Plum’s antioxidants help to flush out and detoxify the skin, making it a great ingredient for those with acne prone skin. This organic, cold-pressed oil from the seeds of the wild rose contains essential fatty acids found in the structure of skin cells. 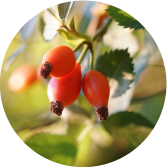 Rosehip seed oil is packed with beautifying ingredients, like vitamins A and C, that help to treat the signs of aging and damaged skin while giving an overall hydrating and brightening effect. Unlike traditional oils, rosehip doesn’t leave a greasy residue and it actually tightens pores. 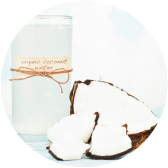 Coconut water is a great source of fatty acids, proteins and vitamins that are helpful to both ingest and use topically. Like babassu seed oil, it contains lauric acid that regulates signals in response to inflammation, and improves wrinkles, fine lines, and dark spots. It’s high levels of vitamin C are also helpful to protect against sun damage. The fatty acids in chia seed oil work to plump the skin and promote healthy cell membranes to maintain moisture and reduce the harmful effects of free radicals. 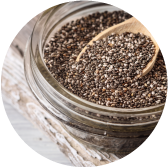 As a rich source of omega-3s, chia seed oil is powerfully anti-inflammatory and hydrating, making youthful, radiant skin achievable for every skin type. Vitamin B3 (Niacinamide) – Anti-aging effects; helps reduce fine lines, dullness and uneven skin tone. Also known as vitamin B3 and nicotinic acid, niacinamide is a very effective skin-restoring ingredient that offers multiple benefits for aging skin. Among these benefits is the ability to visibly improve the appearance of enlarged pores, uneven skin tone, fine lines, dullness, and a weakened skin surface. Niacinamide can also mitigate the damage environmental attack can cause, and is stable in the presence of heat and light. Anti-inflammatory, boosts collagen production, helps form a protective barrier and prevent water loss. Vitamin E (D-alpha-tocopherol) – Increases photoprotection of the skin, reducing UV-induced damage as well as free radical damage from air pollutants, also anti-inflammatory properties. Vitamin E is a fat-soluble antioxidant that is essential for the maintenance of healthy skin. Naturally occurring vitamin E is not a single compound; instead, vitamin E is a group of molecules with related structures, some of which may have unique properties in skin. Vitamin E is also found as vitamin E conjugates that increase stability but require cellular metabolism for activation. Collagen – helps maintain skin elasticity, reduce fine lines and wrinkles, firms and tones skin. Collagen is essential for the health and appearance of your skin, and this protein is also necessary to reduce the typical signs of aging. Collagen is an important building block for elasticity, and its ability to reduce the appearance of fine lines and wrinkles. This protein is also necessary to firm sagging skin, and can even help even out your skin tone. Along with helping to keep your skin flawless, collagen can also improve joint and tissue health. Vitamin A (retinyl acetate) – an antioxidant that protects from UV damage, helps skin retain moisture and improves fine lines. In nature, vitamin A (retinol) protects plants from UV-induced free-radical damage. In skin products, vitamin A is described as an antioxidant that protects the skin against photoaging by fortifying each cell against damage by exposure to free-radicals. In higher concentrations, vitamin A can act as a humectant, drawing water to the surface of the skin. Moreover, vitamin A (topical retinol) is described as improving fine wrinkles associated with aging. Thus, vitamin A actually treats the signs of aging or photoaging. Hyaluronic acid – moisturizing for all skin types, antioxidant. Our extract made from fermented kelp has helpful, naturally occurring compounds and nutrients for maximum skin health benefits. The fermentation process unlocks kelp’s powerful antioxidants that protect your skin and create a barrier to prevent the added moisture from evaporating. The sea kelp acts as an oil-free moisturizer that hydrates and smooths, while reducing redness and irritation. The photoreceptive properties are similar to vitamin E and work hard to neutralize free radicals that can damage your skin. Alpha lipoic acid – antioxidant that prevents aging and inflammation, much stronger than vitamin E & C, exfoliating properties smooth skin. Alpha lipoic acid has been directly linked to skin care as a primary antioxidant that prevents aging and inflammation. Contained in many brands of skin products, this powerful metabolic natural substance has many benefits for skin care, including energy production in skin cells; regeneration of vitamins C and E; inhibiting of the activation of transcription factor NF-kB; reduction of cellular inflammation; stimulation of AP-1, which helps remodel collagen; and protection of the skin from free radical inflammation, including sun exposure. The metabolic antioxidant alpha lipoic acid is often called “the universal antioxidant” because it is soluble both in water and in fat. It is 400 times stronger than vitamins E and C combined. What is perhaps the most valuable property of this substance is its ability to penetrate the skin’s surface and the skin cell membrane. Consequently, alpha lipoic acid benefits both the inside and outside of the skin cell. There are many forms of vitamin C, and many of them are great for skin. They all have potent antioxidant and anti-aging benefits that help mitigate problems both before and after they occur. When added to your daily skincare routine, well-formulated products containing vitamin C provide a range of benefits, from helping to even out your skin tone, shielding skin from the visible impact of pollution, significantly improving hydration, and keeping your skin looking younger. Peptides (Palmitoyl penta-peptide-4, Palmitoyl pentapeptide-3, palmitoyl oligopeptide, palmitoyl terapeptide-7, acetyl hexapeptide-8) – skin restorative properties, improve appearance of wrinkles, smooths skin, increases firmness. Peptides are portions of short or long-chain amino acids, and amino acids are the building blocks of protein. Skin is composed primarily of a protein known as keratin, so peptides have a role to play as part of a complete skincare routine. Ironically, peptides can become unstable in water-based formulas. Further, because peptides are vulnerable to attack by enzymes, the abundant enzymes present in skin can break the peptides down to the point where they have no effect. Knowledge of these inherent weaknesses has led many ingredient manufacturing companies to produce synthetic peptides engineered to be more stable on and within skin. Such peptides can survive intact on skin and better reach their target areas. Some peptides have demonstrated a remarkable skin-soothing effect, while others can improve the appearance of wrinkles, loss of firmness, and even help to soften the look of expression lines. Squalane can be derived from the olive fruit, but our bodies also naturally produce it for moisture and protection. Natural squalane levels peak in our mid-20s, but decline as we age – luckily we can add it into our skincare to stay hydrated and glowing. It absorbs rapidly and, among other things, promotes cell growth and prevents UV and pollutant damage.